Warmth is what I expected to have in July, but if you can't rely on the weather, you have to fix it yourself. I participated in a challenge where you have one month to finish something according to a theme. The theme of the month was WARMTH. 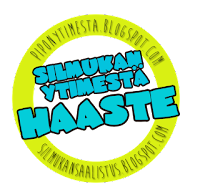 You can find more information about the challenge in the blog Silmukan ytimessä kept by the bloggers Pipon ytimessä and Silmukan saalistus. This shawl is really everything about warmth. It's knitted with warm 100 % wool yarn, the colours are all of warm shades and the shawl itself is big, soft and warm thanks to the garter stitch.